Try frozen fruit drinks, fruit juices or many smoothie recipes can be turned into Popsicles by blending the ingredients in the blender until smooth then poured into molds and frozen. 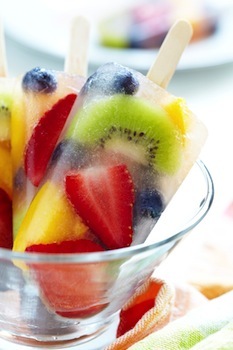 Cut up slices of kiwi, fresh strawberries, mango or other fruits you like and place in popsicle molds. Pour water or 7-up over the fruit. Add popiscle stick and freeze. Add a little water if you would like it thinner. Pour into molds and freeze. Blend in blender until smooth. Pour into Popsicle molds and freeze. Add ingredients to a blender and blend until smooth. Pour into Popsicle molds and freeze. 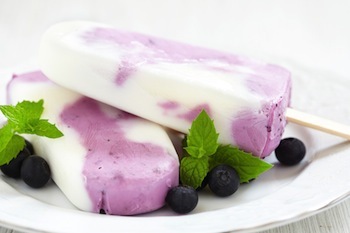 Add vanilla and blueberry yogurt into popsicle mold adding each one a little at a time giving it a layer effect. Freeze. Blend in blender until smooth. Pour into molds and freeze. In saucepan, heat sugar and water. Bring to a boil and stir until sugar dissolves. Allow to cool and stir in lemon juice. Puree fruit in blender, substitute a different fruit if desired or experiment with different flavors. Add sugar mixture with fruit. Blend together. Pour into small paper cups and freeze. Puree in blender strawberries and ¼ cup sugar. Pour small amount in molds or paper cups about 1/3 full. Put in Popsicle sticks. Freeze. Puree peaches and ¼ cup sugar in blender. Pour over frozen strawberry layer. Freeze. Cube watermelon and remove seeds. Puree watermelon and ¼ cup sugar in blender. Pour over frozen peach layer and freeze. Add ingredients to blender and blend until smooth. Pour into popsicle molds and freeze overnight. Put mandarin oranges or peach slices into the bottom of a plastic cup. Pour peach or orange juice into the cup until almost full. Poke a stick through a square of tin foil and into cup. freeze overnight. to get Popsicle out, run warm water on the outside of cup and gently slide Popsicle out. Enjoy a healthy treat. Stir and pour into molds or cups and freeze. Cut apples and mix with juice. Pour in cup put Popsicle stick in. Freeze. Pour Gatorade into Popsicle molds and freeze for a frozen, somewhat healthy treat. Try mixing two juices together for a different flavor. Stir together and pour into molds. Freeze. Mix the water and the Kool-Aid together to make juice. Pour the juice into ice cube molds. Freeze for 24 hours. Can eat it with juice, water, or just eat it plain. Pour orange juice into small disposable plastic cups until half full. Then, pour peach soda to fill the cup. The color of the pops is much prettier if done in this order. Cover with plastic cling wrap. (tin foil works too) Freeze over night for best results. Tip: for stubborn pops run the cups under warm water. We don't use exact amounts. 1. Get an ice tray. 2. Get a can of pop...any kind. 3. Poor the pop into each slot. 4. Then take either straws or popsicle sticks and put them in. Try your best to make them stand(they may not stand straight up)!! Pour into molds. freeze. enjoy! Beat mixture in blender, pour into molds and freeze. Enjoy! Dissolve gelatin in boiling water. Allow to cool. Then stir in yogurt and milk Pour into Popsicle molds or cups insert sticks and freeze. Do you have kids 3-6 years old? 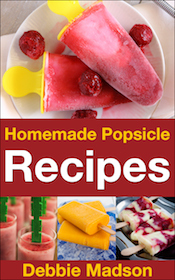 Try this kids cooking lessons on practice pouring and making popsicles. 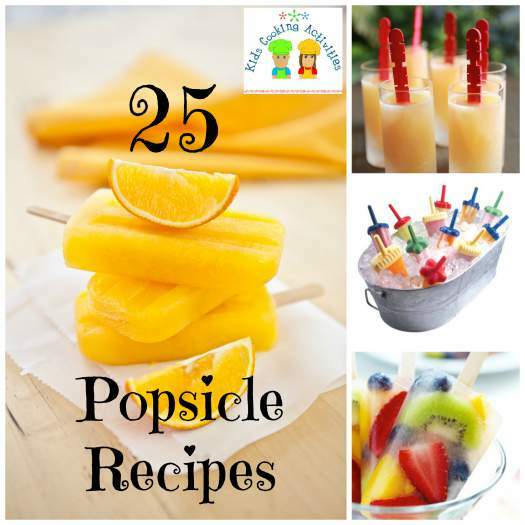 Popsicle recipes are something easy to make and kid friendly. 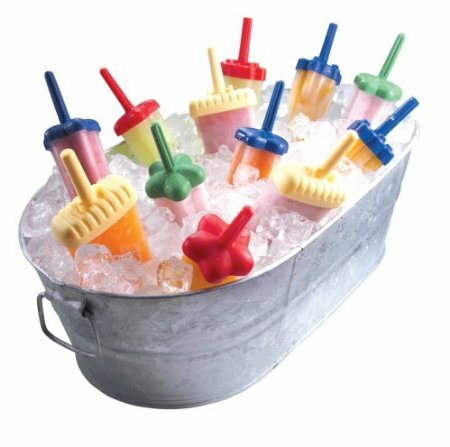 Any drink mix will taste great poured into Popsicle molds or small paper cups with a Popsicle stick inserted. However, sugar free or drinks such as Crystal light won't turn out as well. So if using those mix a little juice, fruit drink or Kool-Aid in with it before freezing. 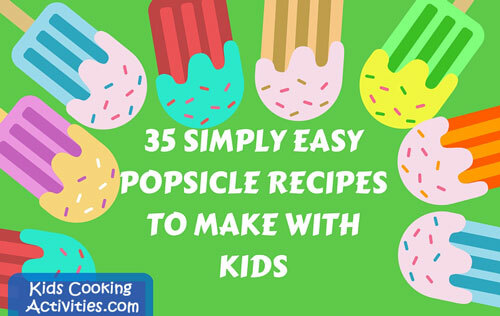 Most of these Popsicles require a pudding mix, a lemonade mix, some juice or a recipe of your own that is easy to make. Just follow the directions on the box or package and pour into the Popsicle molds. What is your Favorite Popsicle Recipe?